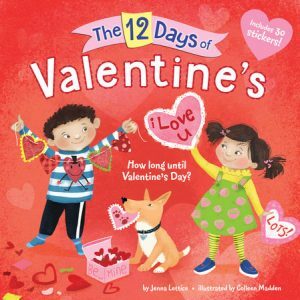 We’ve taken a look at a lot of Valentine’s Day books which is why we’ve decided to add a second part to our holiday roundup. 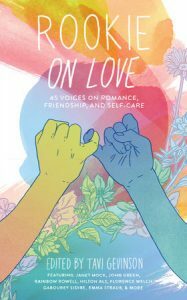 This year we’re adding some fun gift books into the mix because, for us, sharing the Valentine’s Day love means sharing books. It may be last minute, but here’s a chance to make every minute matter. 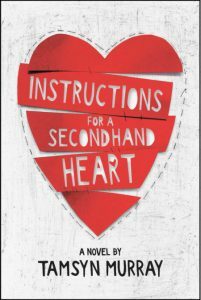 Head over to your local indie bookshop and pick up any or all of these books to make Valentine’s Day 2018 best one ever! 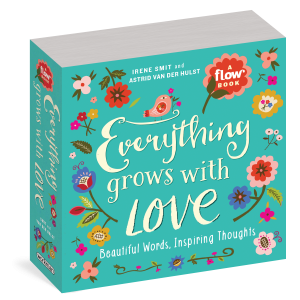 From the editors of Flow, an international mindfulness magazine, comes Everything Grows With Love, a purse-sized soft-cover book filled with over 100 feel good thoughts including affirmations, motivational sayings and quotes. 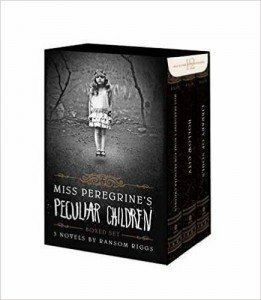 Imagine 396 pages of sheer joy and you’ve got a good idea what to expect when you open the cover of this creative book. 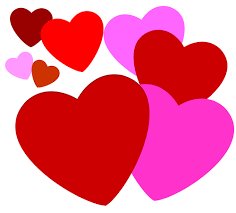 There are decorated lines from songs like “Somewhere over the rainbow …” and simple statements such as “Let’s cuddle” and “Collect moments, not things” that are turned into art. Cool calligraphy, paint, chalk lettering, embroidery, even Scrabble-like letter tiles will greet you and invite you to turn the pages. I didn’t go through the book in order so that I could see what randomly appeared. My favorite illustrations are the animal ones, particularly the anthropomorphic mice, cats and bunnies, but that’s not to say that the vivid colors or soothing pastels and original designs and lettering coupled with the inspirational sayings don’t also lift my spirits, because they do and then some! 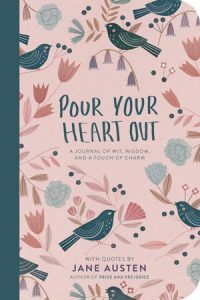 Give this book to someone you love for Valentine’s Day or Mother’s Day and spread the love around. 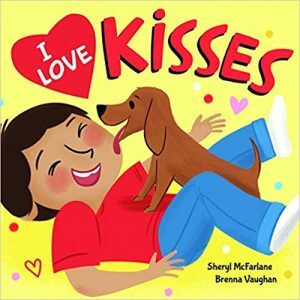 Not only is the title, Warts and All a good one, so is the heartwarming sentiment of this adorable picture book. 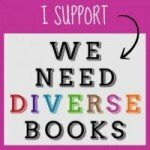 It’s the kind of story parents will enjoy reading at bedtime and kids will enjoy hearing. 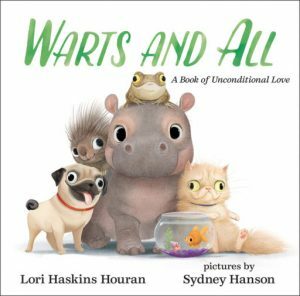 Warts and All is filled with precious animal kid characters from bats and birds to ponies and pugs. Hanson’s illustrations in subdued shades achieved with water color and colored pencils beautifully complement Houran’s easy flowing text. What a wonderful way to send youngsters off to dreamland with a caring message of love. The book opens with this honest line: “So here’s the thing. I love you. And not just when you’re sweet and cuddly.” In other words, not part time, but all of the time. Parents can use the story as a jumping off point for a reassuring conversation. Children will learn they are loved no matter what their mood or their actions are (and yes, that includes burps). And even when, like the spray from a sweetly portrayed skunk, they’re stinky! This book makes a nice companion to I Love You Stinky Face. Here’s a book that needs no describing. 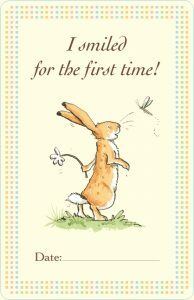 Little Nutbrown Hare and Big Nutbrown Hare are back in this must-have classic board book set for new parents. Guess How Much I Love You, already a fave in so many households, is made even more giftable with the addition of beautifully illustrated milestone cards. 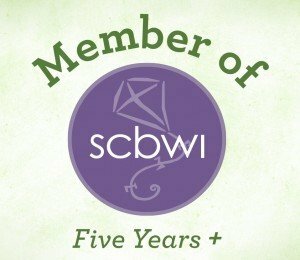 For the cell-phone photo taking and social media savvy generation, the 24 cards make documenting all baby’s once-in-a-lifetime moments as easy and unique as ever! 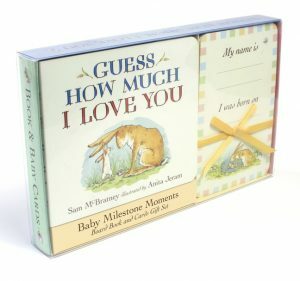 For Valentine’s Day or as a baby shower gift, this board book and cards gift set is a great idea for those of us who forget to keep track of pictures and, when looking back years later, cannot remember what milestone the photo was taken for. Capture those moments and make everyone happy. Who doesn’t know and love Big and Little Nut Brown Hare? 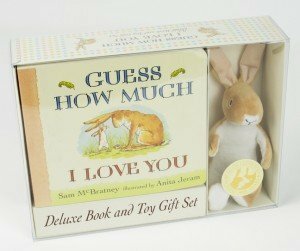 With this gift set that includes a board book and soft Nutbrown Hare plushy, little ones will be reminded that there’s no limit to the love that’s felt for them. And who can forget the oft quoted phrase, “I love you to the moon and back” without feeling a tug on those heartstrings? An affordable gift that’s sure to please. 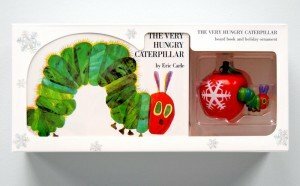 The beloved children’s classic “that teaches children about numbers, days of the week and time,” is perfectly paired with the most adorable apple ornament with that very hungry caterpillar emerging from it. I can just picture the smiles on children’s faces when they not only get to hear the story, but also when they get to enjoy seeing this unique Christmas decoration hanging on their tree. Destined to become a keepsake, this exclusive gift set will make a welcome gift for any family. Journey back in time in the comfort of your very own living room as you hold this amazing collection of treasures from the past right in your hands. Explore ancient civilizations from around the globe as you tour the continents seeing stunning illustrations of a broad range of artifacts. Flip slowly through the pages as you would leisurely stroll down a gallery in a world class museum while studying descriptions as detailed and interesting as you’d find in any display case. Nelson and Wilkinson take us first to Africa then onto America, Asia, Europe, The Middle East, and Oceania. There’s also a comprehensive index. I couldn’t down put this oversized volume of often “sacred and culturally important items,” and you’ll find it hard to believe the illustrations are indeed artwork and not photographs. I found the Fresco from Pompeil (p. 61) depicting a Roman woman particularly appealing although picking favorites is difficult when the book contains so many glorious achievements in craftsmanship. 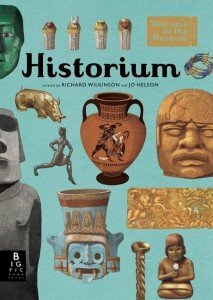 From pottery to pillars, rock paintings to royal cemetery headdresses, Historium has it all and then some. And fell … in Eaton Square. 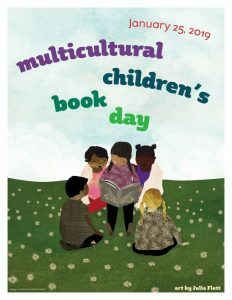 I absolutely love this little book and so will your child. 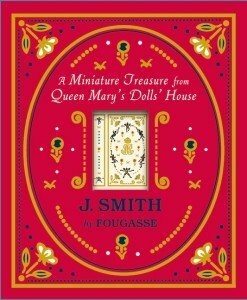 They had me at miniature!